Canadian band Dearly Beloved’s third release, Make It Bleed, has that pure punk edge with pervasive drums, frenetic guitar riffs and grooving bass. 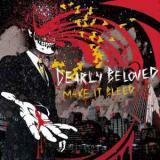 Dearly Beloved exhibits straightforward attitude, grittiness and passion which bolster the entirety of Make It Bleed. The simplistic lyrics work with the band’s bold, gritty compositions and catchy hooks. The band clearly likes to experiment with arrangements and musical styles. Singer/songwriter/bassist Rob Higgins travels into White Stripes territory on a song such as “Candy Coated.” There’s the hip-shaking, cocky “Move On” and the urgency of “The Ride.” Singer Niva Chow adds buoyant vocals on the thunderous, grooving title track and “Fire Escape.” She harmonizes with Higgins on the Deep Purple-esque “Who Knows?” Make It Bleed is ferocious guitar-fueled rock. This entry was posted on April 11, 2010, 15:07 and is filed under Music. You can follow any responses to this entry through RSS 2.0. Both comments and pings are currently closed.